Color Guard performs as the visual ensemble for the award winning TOHS Lancer Band. 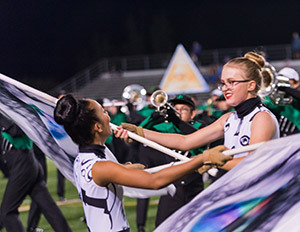 Color Guard performers learn dance, flag rifle and saber skills participate in field and indoor performances. In the fall, the Color Guard performs with the Lancer Marching Band in a field presentation lasting about 7-8 minutes. Fall performances include home football games, rallies and field show competitions. 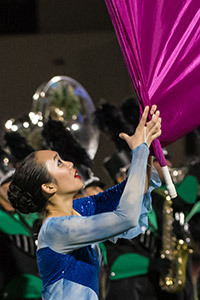 In the winter and spring the Color Guard moves indoors to develop a winter guard show – a routine about 4-5 minutes long performed to a pre-recorded soundtrack. 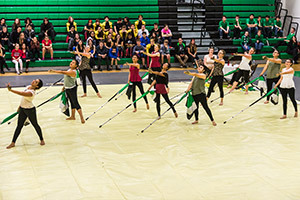 Guard members perform this show at competitions throughout Southern California. 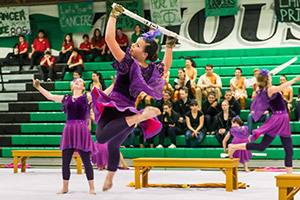 The TOHS Winter Guard is a member of the Winter Guard Association of Southern California. More information about the Color Guard program is available prior to our auditions in May. We offer several clinics prior to the audition and we’ll teach you everything you need to know. All you need to bring is enthusiasm, a willingness to learn. Both girls and hoys are welcome, and no previous experience is needed.